4Shared.com is a file sharing website. If you want to download all the files from a folder shared with you, you need to download them one by one. If you have a premium account which will cost $9.95/month you can download them as a zip file. Here is a work around which you can try, I don’t know how many days it will last but it works as of now. You need to have a 4Shared.com account, which you can create for Free. Your task was sent to the background. You can now close this window and we’ll notify you when it’s complete. Your account will have a file with .b1 extension you can download that file as you download other files from the 4Shared website. The file you downloaded will be in the b1 format. To extract it you need to have B1 Archiver. You can download this application for FREE from here. While installing this it will ask for downloading additional software (like the Ask Toolbar), check it carefully and select the software only if you want them. After installation the action will be in the context menu, so right click on the b1 archive file you downloaded and select Extract here or Extract to option. That is all you need to download a 4Shared folder and all its contents together as an archive file like zip. 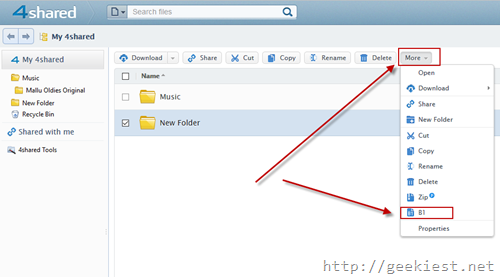 Download a 4Shared folder and all its contents as a single file like zip for FREE.